What is meant by "move up/down the directory tree"? To understand it open the treeinfo.wc file built by Total Commander. You'll see all the directories of some logical disk in the directory structure order. To save time, you can open the dropdown list and select "current dir only" (4). If the search fails, it could be due to two reasons. First, you've never give commands of the cm_SrcTree family, and the cm_CDtree (Alt+F10) command. Second, your wincmd.ini has TreeFileLocation and TreeFileLocationE keys with non-empty values. If so, you can force Total Commander to build the treeinfo.wc file, for example, by pressing Alt+F10. This or that way, but suppose that treeinfo.wc is available. Then you can realise what the "directory structure order" is - it's just alphabetical order of full paths of all directories of a disk. "Tree view", "CD Tree", and, finally, "separate tree" are visulalising this directory structure order. So, if you move down the directory tree, you pass to the next (lower neighbour) directory relative to the current one, when moving up you go to the previous (upper neighbour) directory. These are actions that my scripts perform. What are advantages of script over the Tree View? If you need to move to the previous directory, you have to perform too many operations: switch to another panel, activate tree view, wait for the tree to be built and, finally, press the Left key. With the script it's enough to press one button or one hotkey. If you reach the first (root) directory on the current disk and run the script again, you can go to the previous disk after confirmation. Thus, you can visit all directories of your computer. The same is valid when moving down with another script. After passing to the last direcctory on a disk (represented by the last line of the treeinfo.wc file) you'll get the invitation to visit the next disk. In this section three pairwise (up/down) scripts are presented. Why they differ? When use this or that? Scripts TreeDownCmd and TreeUpCmd, as their names demonstrate, are using internal Windows command dir. Parameters "%p", "%n" are passing from Total Commander to scripts as usual. Scripts TreeDownX and TreeUpX require the Xxcopy application. That means that you must at least download and install it, and also indicate the Xxcopy path in the script code. On the other hand, these scripts are slightly faster. Moreover, they can work with national alphabets, that's why I prefer these two. In the "Parameters" field indicate %P%N without quotes. It's a good idea to assign the Alt+PgDn and Alt+PgUp hotkeys to TreeDownX and TreeUpX scripts, respectively. Finally, TreeDownXMouse and TreeUpXMouse scripts are generally equivalent to the latter two. They also need Xxcopy that is denoted by the "X" letter in names. The difference is that TreeDownXMouse and TreeUpXMouse do not need any parameters passed from Total Commander. What are advantages of this peculiarity? You can call these scripts from outside Total Commander, for example, from a PowerPro bar. Take my configuration file and simply import it to PowerPro, and that's all. 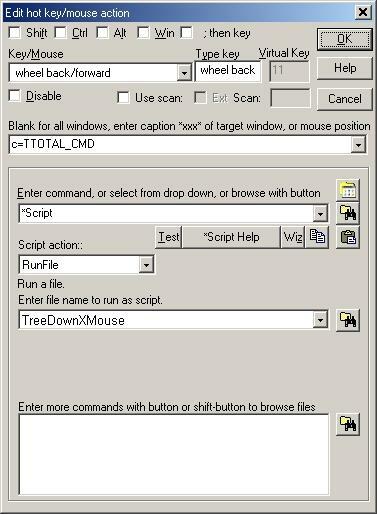 Press OK, then "Clone", open new line properties and replace "TreeDownXMouse" with "TreeUpXMouse", and "wheel back/forward" with "wheel forward/back".